Swiss Army Altitude is a fresh woody fragrance suitable for real men. Swiss Army Altitude For Men 100ml. Eau De Toilette is a fresh woody fragrance suitable for real men who pursue their goal and do not stop until they get what they want. Early notes of the perfume Swiss Army Altitude are played by agreements freshly picked blueberries and cedar notes and hide in the heart of the fragrance of mint and sparkling arrangements sage base. Swiss Army Altitude fragrance is composed of exciting and mysterious wood notes. This exclusive men's fragrance can be worn all day. Swiss Army Altitude is perfect Accessories for a real man who is not afraid of anything! First notes of flavor "of acceleration and energy" define his character. Snow juniper, cedar leaves and patented molecule Life scent create agreement, designed to replicate the coolness of pure oxygen peaks. Heart fragrance gives the new character Altitude and acts as a bridge to the warm base notes. Winter mint, gentian root and mountain sage harmonious flow through the heart to the top notes of flavor included in base perfume notes warm natural wood, dried by the sun, rocky lichen moss and wood. It is these notes create a feeling of comfort and softness, thanks to them aroma naturally keeps the smell of leather. Date aroma: wood, furn initial note: The Virginian cedar, juniper berries note "Hearts": jasmine, sage, mint blue Final note: woody notes. a fragrance for men from famous Swiss brand producing luxury jewelry and fashion accessories Victorinox Swiss Army. Perfume Swiss Army Altitude by Victorinox Swiss Army was created in 2001 and joined the group of woody flavors furn. For lovers of deep and exciting unisex fragrance was created by perfume Sombre Negra by Yosh. 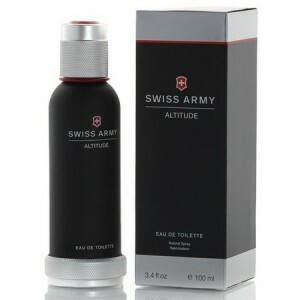 fragrance Swiss Army Altitude opens top notes of warm wood virgin cedar and tart freshness Juniper. "Heart" bouquet reveals delicate white jasmine petals, framed cool glow blue sage and mint. At the heart of the fragrance is warm and noble valuable timber.